Explore the designs and uses of rag mops, sponge mops, flat mops and more, and discover all the differences! Not everyone loves mopping, but it's a task you can only ignore for so long. Once you decide to stop avoiding mopping then you'll have to figure out what type of mop is going to be able to suit the needs of your home. If you aren't a mop-shopping pro, it can seem like there are tons of mops that you'll have to choose from! It's important to remember that as many mops are on the market today, they all only fit into a few categories. You'll also want to remember the each type of mop works the best on certain types of flooring. Consequently, it's important to make sure that you make the selection that will work most efficiently on your floors. To help you with determining this, we're going to take an in-depth look into the 6 mop types and give you some ideas about what each type is good for. When you're looking to get serious with your mopping, a steam mop is the way to go. These mops tend to be a bit more heavy-duty than other options out there. Consequently, they are also an option that can come at a more expensive price, so you'll want to remember that. The reason the price tends to be higher on these machines is because they are just that, machines. Most mops contain a handle and some type or rag, sponge or other material great for holding water and scrubbing. Meanwhile, a steam mop contains water in a tank, which it then heats up to use for more efficient cleaning. When you use a steam mop, the heated steam releases onto the floor through the mopping pad. Because it's hot, it's able to do a better job of lifting up difficult messes. One of the aspects people love about these mops is that they disinfect the area as well as clean. That isn't something all other kinds of mops do. As a result, they're a perfect option for messes that may contain germs you don't want spreading around. Though you don't have to use it all the time, it's a good idea to have a steam mop around for when you need to do that serious cleaning. Most of the time, a standard type of mop will probably work just fine but once in a while something more is helpful. If you're looking into getting a steam mop, make sure it will function well on your floors without causing any damage. For the most part, steam mops can work well on laminate, linoleum, hardwood and ceramic tile for a deep clean. These days, flat mops are among the most common mop that show up in our closet of cleaning tools. They are often lightweight, easy to use mops. Consequently, they do a decent job of handling a lot of our quicker, easier jobs. That said, they may not always be ideal for bigger messes. In many cases, these mops also make the job easier by providing pads on the mop head. These pads you can either re-use or dispose of depending on your preferences. While this can make the job easier, the cost of disposable mop pads can also add to the price. There is a lot of convenience with these mops. They take just a moment to set up and you can get the job done in no time. Consequently, they're ideal for regular maintenance and picking up smaller amounts of dust and debris that can end up on your floor. 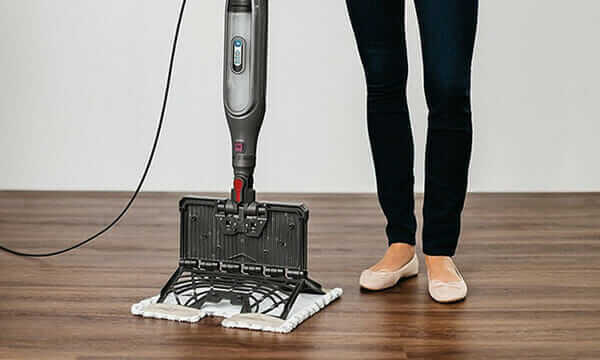 However, if you have food or dirt that is stuck on the floor, these mops may not be able to get it cleaned up as well as some other options can. As a result, it's a good idea to have a back-up mop. That way, you'll have something that will provide you with something to use on heavy-duty messes. Having both of those tools around will ensure you're ready for just about any mess. That way, you won't have to worry about struggling or breaking a flat mop while scrubbing up a difficult mess. If you find that the mop breaks anyway, it's not too big of a deal. One of the great aspects about flat mops is that they tend to have a lower price. As a result, it's a great go-to method for those who need something quick that can handle most of the simpler jobs. Another type of mop that many people are familiar with are strip mops. These are made using strips of an absorbent material to create a full mop head. These also come in both disposable and re-usable options to suit the needs of your household quite easily. For those who want something a little bit more powerful than a flat mop when it comes to scrubbing, then a strip mop can be a great option. They tend to be able to handle most cleaning. In addition, they are also easy to maintain so that you can continue using the mop for a long time. Another convenient feature about strip mops is that they can dry very quickly after you've used them. Consequently, you won't have to worry about guests seeing your mop sitting out as you wait for it to dry, or putting a wet mop into a closet or cupboard to grow mildew. Generally speaking, strip mops are similar to flat mops and tend to be better for regular maintenance and lighter jobs. The difference is that these mops tend to be able to scrub a little better than a flat mop. As a result, you can get more use out of them. One thing you'll want to consider when shopping for a strip mop is the material the head contains. This is because some materials are going to be better for certain types of flooring or more absorbent than others. Furthermore, some options are able to last longer and be washed in your washing machine. Meanwhile, options such as microfiber can tend to dry more quickly than others. If all of that doesn't solidify the importance of a strip mop, then maybe it helps to know that they have been cleaning homes effectively for hundreds of years. Many of us are familiar with the usefulness that sponges can provide with washing a wide variety of things. However, not everyone wants to get on their hands and knees with a sponge to clean their floors. Instead, sponge mops are an option that make scrubbing your floor easier. If you have a flooring type that is a bit uneven, such as tile, then a sponge mop can be your best bet for a complete clean. Furthermore, the sponge head tends to be easier to rinse and wring out than other options. There are plenty of people who also prefer these on hardwood because they can wring out a lot of water. What's important to keep in mind with these mops is that they need a little more care than other options. You'll want to make sure that you keep the sponge clean and free from bacteria. Otherwise it will be much less effective when you use it for cleaning. Ensuring that the mop head dries fully is key to being able to use your mop for a long time. Otherwise, bacteria can begin to grow which can cause a problem for the mop as well as any place it is stored within. There can be some problems in certain cases with sponge mops. These can include the sponge breaking down or breaking off the mop head altogether. However, if you take good care of the mop it can be well worth the effort. Due to the scrubbing ability on these mops, they are a good choice for households that may experience more messes. There are even some specialty options that include useful tools including Magic Erasers that can make the mop even more effective on a wide variety of hard flooring types. String mops are similar to strip mops, but use smaller pieces to create the mop head. Oftentimes, these strings are made from bits of cotton, making it a great option when you need to handle jobs that are a little tougher than usual. However, because of the material they use, they can be a little harder to take care of them other options. String mops can take a bit longer to dry out after you've used them, and the mop head can begin to fall apart more quickly. Furthermore, it can be tougher to get them to wring out very well. On the other hand, these mops are ideal for getting into spaces that flat mops may not be able to. As a result, cleaning up corners and other tight spaces can become much easier. If you make sure to take the extra care they need, these mops can be a very reliable cleaning solution. Another aspect that makes these mops very convenient is the fact that they are rather inexpensive. Consequently, they tend to be easier to replace than some of the more expensive options in this list. They are also a durable option in many cases, which is great for stickier messes. If you decide that a string mop is the right option for you, then it's going to be important to make sure you get one that is of a decent quality. Otherwise you may find little bits of cotton and fluff end up on your floor after you're done cleaning. Just like any other mop, if you don't already have a favorite then it might take trying out a few different options in order to find one. Just don't worry, you'll get there in time. Reading reviews for the potential choices can be a great help! Unlike many other mops, dust mops aren't ideal for giving a space a deep cleaning with regard to sticky, messy substances or spills. Instead, these are mops designed for dealing with dust, cobwebs and other kinds of things that can be brushed away from a surface. While they do use the name mop, these tools actually are more commonly used on walls, windows, shelves, light fixtures, and other surfaces that can accumulate dust. These mope are similar to feather dusters, though these two tools are ideal for different tasks. Depending on your personal preferences, you can get a dust mop made from a multitude of different materials. These can include things like synthetics, wool, microfiber mop and other materials. It's also important to keep in mind that these mops aren't made to be used while wet, but instead work perfectly well dry. In addition, there are plenty of options out there that can be re-usable or disposable, so whichever you need will be available for you. If you choose a re-usable option, then it's a good idea to make sure you wash the mop heads separately from other materials to avoid any potential problems. If you're wondering how and when to use a dust mop, then don't fear! Essentially, these mops are a great option to use before you do your regular mopping. That way there's less dust and debris for the wet mop to pick up when you start the deeper clean. Due to their simple design, these mops tend to be easy to use and care for. You won't have to worry about them becoming gross due to water because they aren't made to be used with water to begin with. You can think of a dust mop as like a broom, but potentially a bit more thorough.